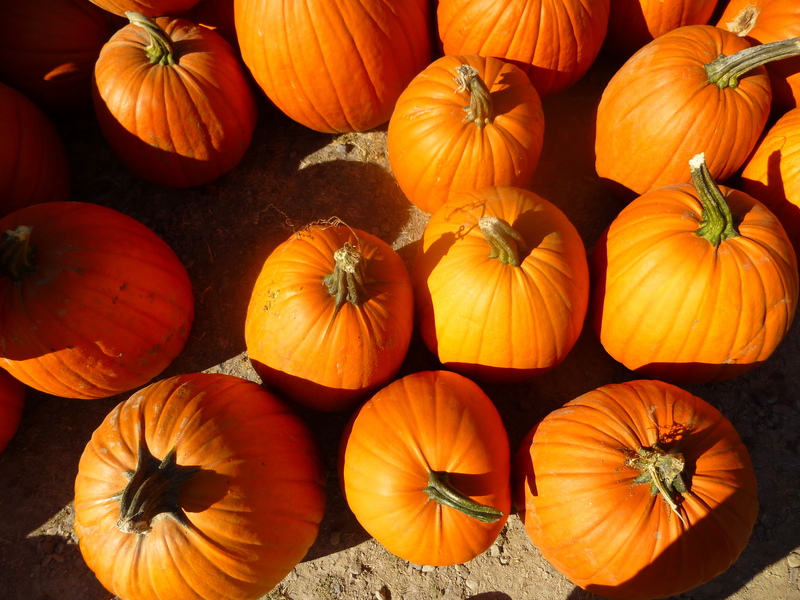 It turned into November here around mid-October, before I even had time to celebrate that wonderful month in this blog (but I have been celebrating the birth of my grandson, Levi, in mid-October!). Still, even in November, there are the sights and smells and tastes of autumn. Cool rainy weather inspired me to go back to the old staples. The minestrone soup, the leek-potato soup, the roasted vegetables and baked squash, the mushroom risotto, the slow-rise bread and any-night pizza. 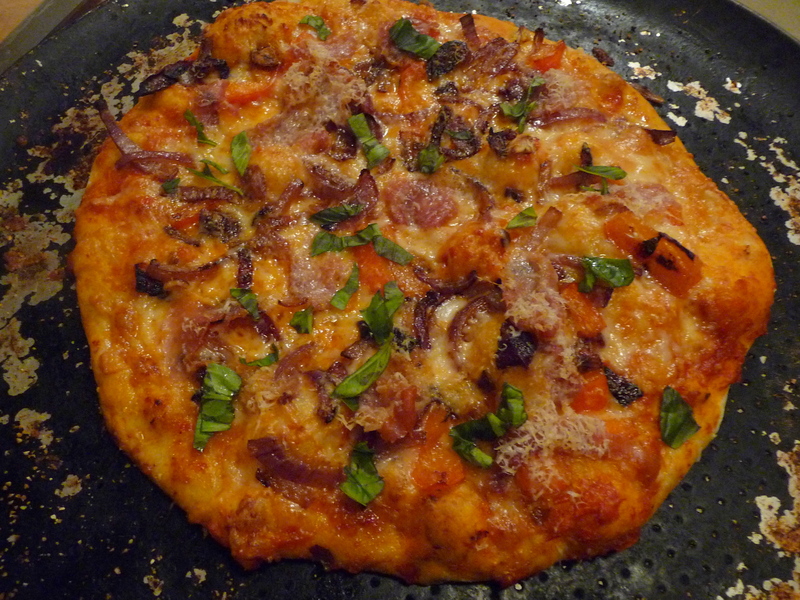 I often keep pizza dough in the fridge so I can make this in a jiffy. Roasted red pepper spread often stands in for pizza sauce. 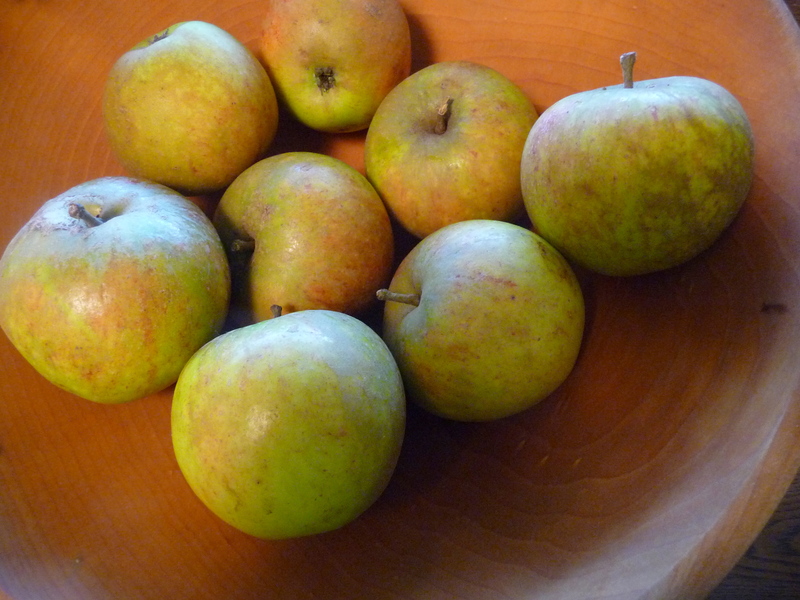 It’s also still a wonderful time for apples and pears. At the farmers’ market in Port Townsend, I was thrilled to find Cox’s Orange Pippin apples, a wonderfully flavorful apple that is rarely grown in the U.S.
We visited friends in Cashmere, and Maggie and Scott gave us Bosc pears and King David apples (a variety I’d never tasted before — and it is a fantastic apple: crisp and juicy with a delicious tart-sweet flavor). 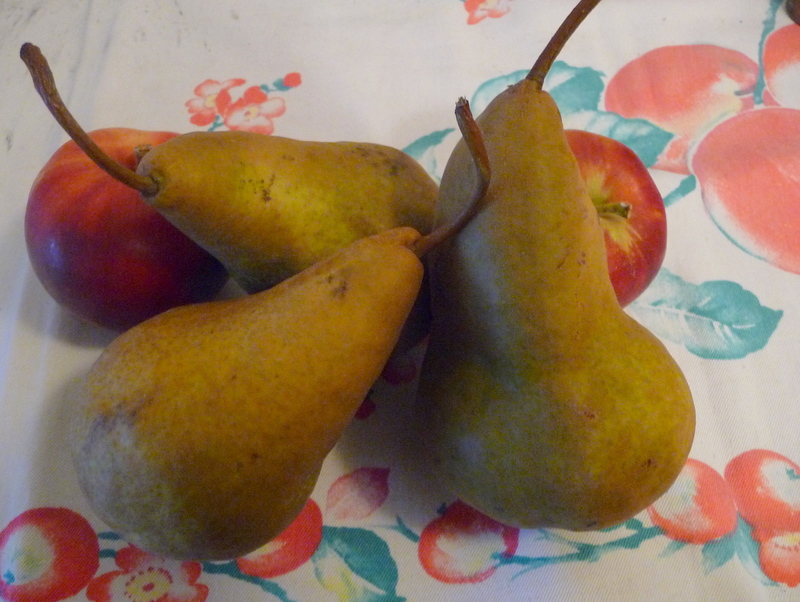 Four of the pears ripened at once. 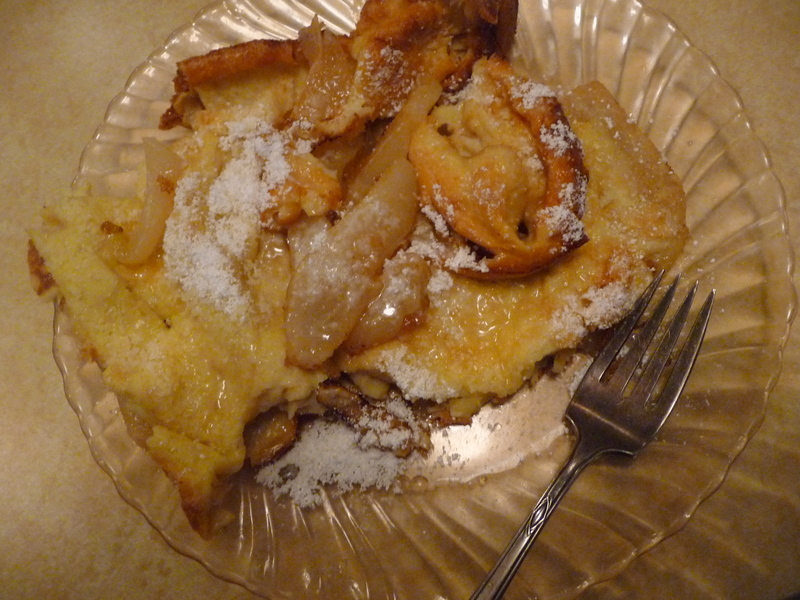 We ate two of them for dessert last night; then this morning, I peeled and sliced the other two and sauteed them with a touch of sugar and cinnamon, then laid them in a skillet and poured over an egg-y batter to make a Dutch Baby. 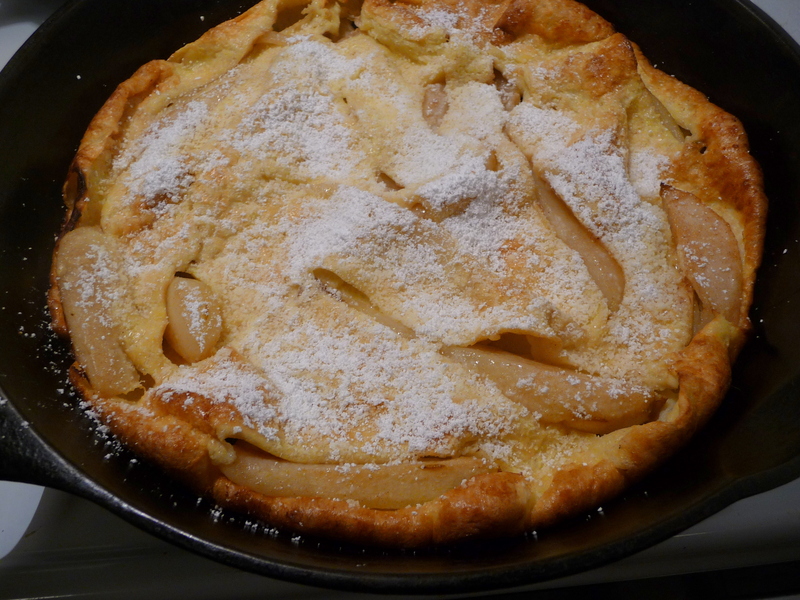 My dad used to make this for a Sunday breakfast or light supper (we always just called it “oven pancake” or “German pancake”). Not only is it easy to make, but it’s so impressive when it comes out of the oven. 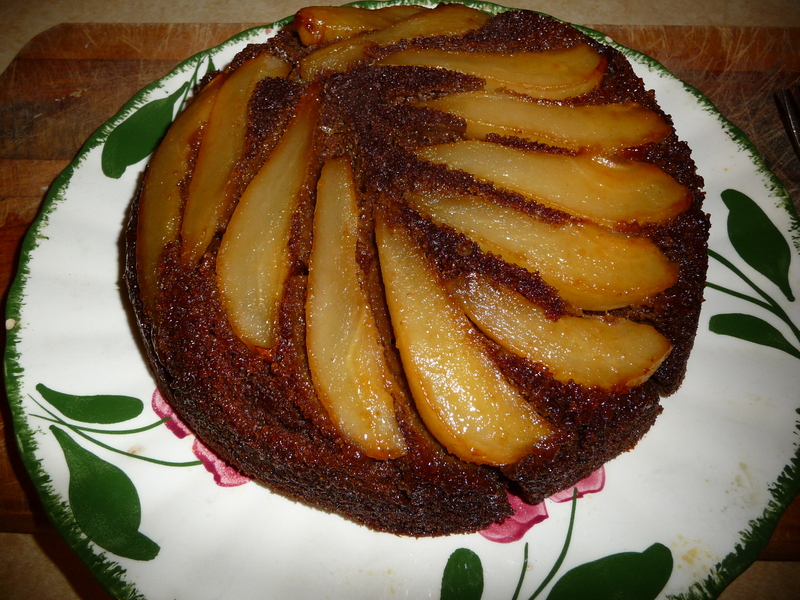 Any way you make it –with fruit on the bottom (apples are more traditional) or atop or not at all– it’s a keeper. Preheat the oven to 450 degrees. Butter one 12-inch skillet or four 6-inch small skillets (with ovenproof handles) or pans (you can use small pie pans or cake pans). Break the eggs into a small mixing bowl and beat until thoroughly mixed. Add the milk and blend well. Sift the flour and salt onto a square of waxed paper. Lift the waxed paper up by two corners and let the flour slowly drift into the egg and milk, whisking steadily. Or slowly sift the flour and salt directly into the egg mixture, while whisking to blend and smooth. Add the melted butter and mix briskly so the batter is smooth. Pour the batter into the pan or pans and bake for 15 minutes at 450 degrees. If you are baking small pancakes, they will be done after 15 minutes. If you are baking just one big pancake, reduce the heat to 350 degrees and bake another 10 minutes. Sprinkle lemon juice over the pancake (or pancakes) and dust the top(s) with confectioners’ sugar. Serve at once. 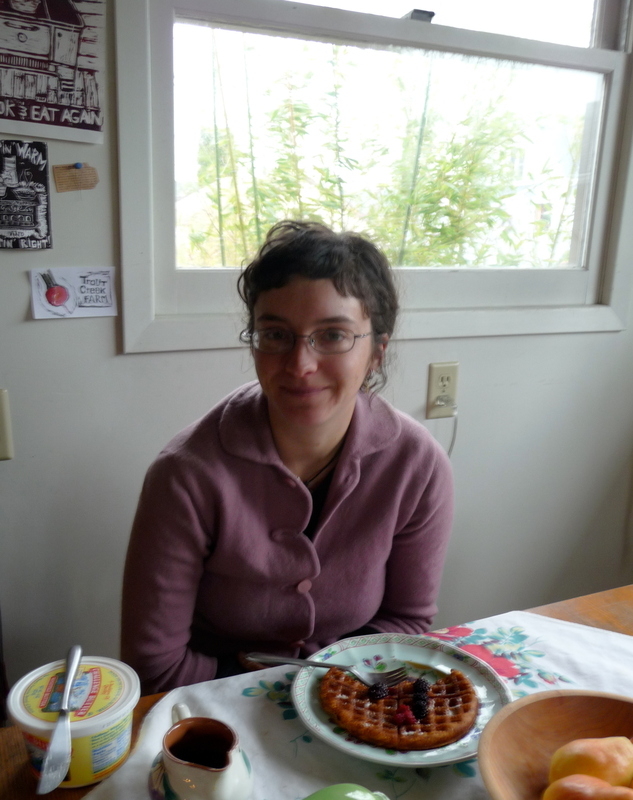 So, it was my birthday, and I had planned to make my favorite breakfast, yeasted waffles, and serve them up to Aviva and Reeb. 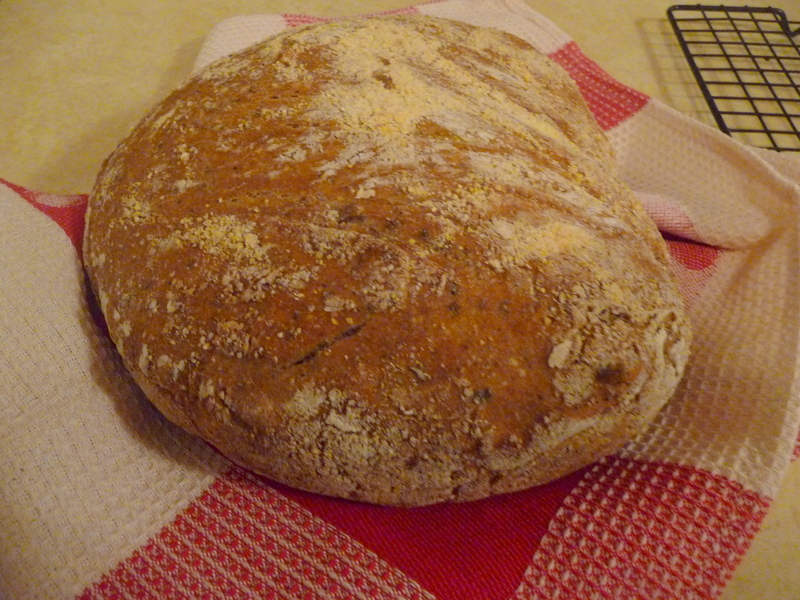 I mixed up the batter the night before, so the yeast would have time to do its magic…. Then a wild windstorm came up in the night, with fierce gusts that shook the windows…. and the power went out. 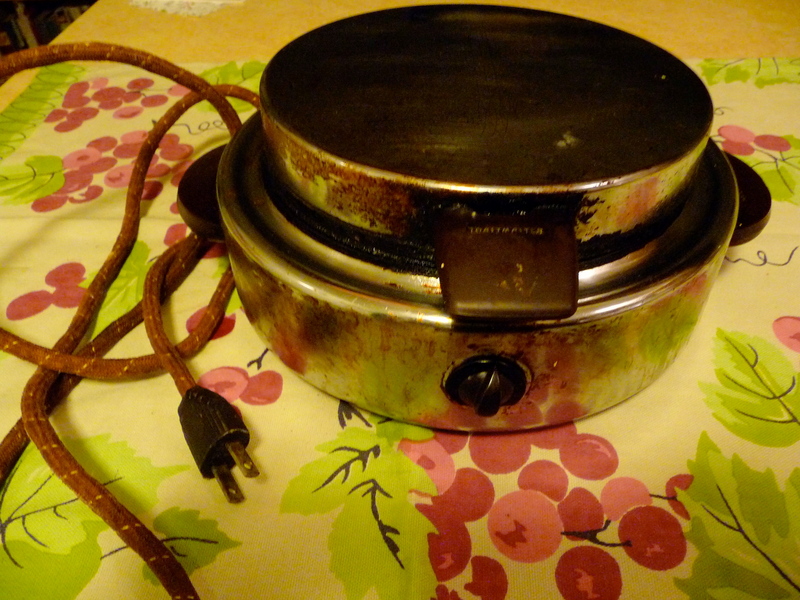 My kids found this classic Toastmaster waffle iron for me in a thrift store years ago, and I love it. 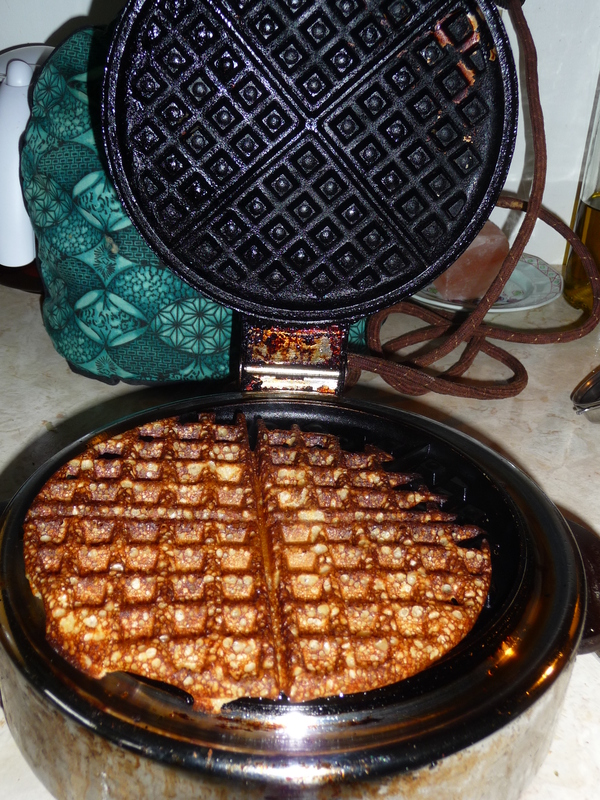 There was still no electricity in the morning as I looked sadly at my waffle iron, wondering what I would do. Fortunately, Reeb’s house still had power, so she suggested I come on over and make the waffles there. I packed up my waffle iron, the big bowl of batter, some blackberries I’d defrosted, and some maple syrup, and headed over to Reeb’s. 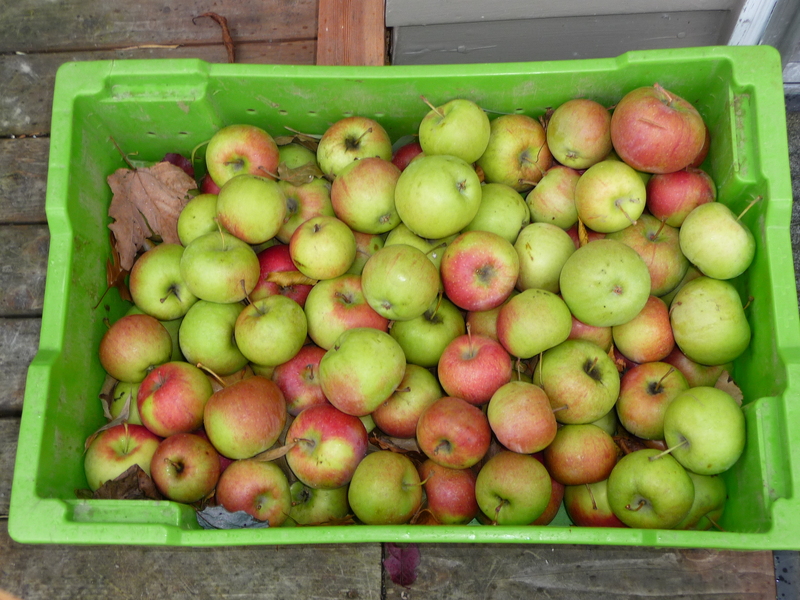 Reeb had a lovely box of apples by the back door. I fired up the waffle iron, added a couple of fresh eggs (from Reeb’s chickens) to the batter, and made some nice crispy waffles, while Reeb made us all some delicious coffee with steamed milk. And so we spent a sweetly nostalgic and delicious morning cooking and eating waffles, drinking coffee and talking around the kitchen, all warm and cozy on a grey and blustery November day. What could be better? I got my recipe from Marion Cunningham’s “Good Eating,” (which has two of her books, “The Breakfast Book” and “The Supper Book”). 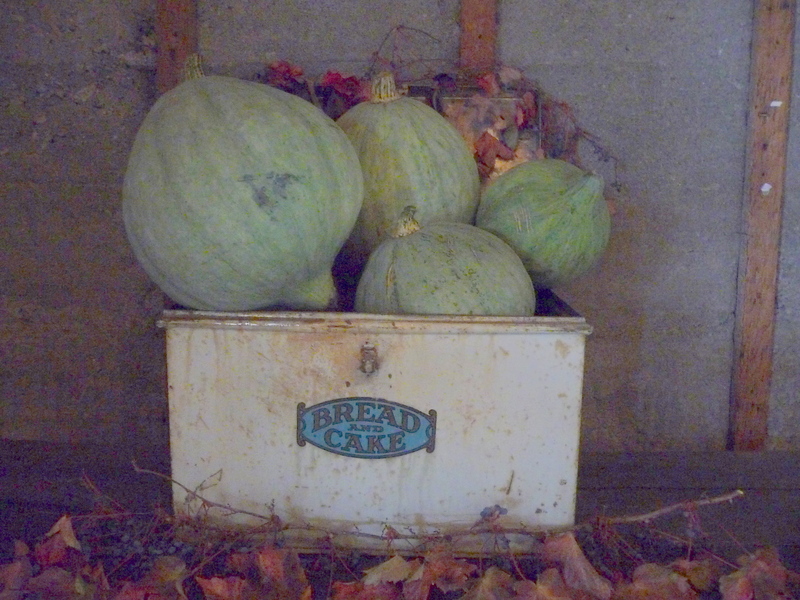 And she got the recipe from the Fanny Farmer Cookbook (originally published in 1896) when she updated it in 1979. It is truly an American classic. As is she. Here’s a tribute to Marion Cunningham by David Lebovitz (which includes a tribute to the raised waffles as well). Of course, as with any recipe, you can mess with it, and I did a little, using whole wheat pastry flour rather than white flour, adding a tablespoon of whole flax seeds, and reducing the butter (I used 1/4 cup of butter plus 2 tablespoons of olive oil in this batch, and I have used less butter than that with success as well). 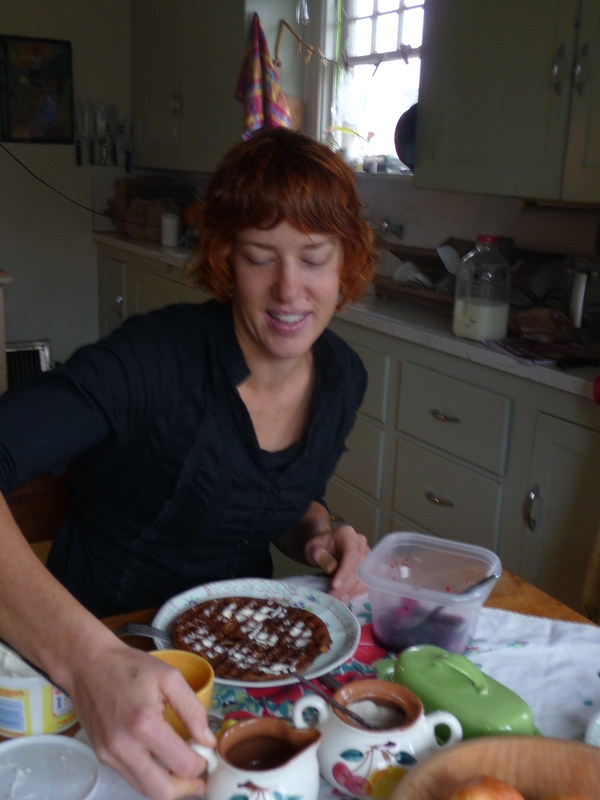 Once I made waffles using all spelt flour for my friend Nia, since she can’t handle wheat too well — and those turned out great too. Another variation on the raised waffle recipe is on this Crispy Waffle blog, devoted (mostly) to that fabulous food. Well, my birthday waffles were just the way I love ’em: tender on the inside and crispy on the inside. Make these and you may never order waffles in a restaurant again. Use a rather large mixing bowl–the batter will rise to double its original volume. Put the water in the mixing bowl and sprinkle in the yeast. Let stand to dissolve for 5 minutes. Add the milk, butter, salt, sugar, and flour to the yeast mixture and beat until smooth and blended. Cover with plastic wrap and let stand overnight at room temperature. Just before cooking the waffles, beat in the eggs, add the baking soda , and stir until well mixed. The batter will be very thin. Pour about 1/2-3/4 cup batter into a very hot waffle iron. Bake until golden and crisp. This batter will keep for several days in the refrigerator. Postscript: After eating several of these waffles, we did not, needless to say, feel the need for lunch, but when Aviva and I got home, the power was back on, and much later in the evening, we made a small gingerbread-upside-down cake with caramelized pears (and baked it in a cast iron skillet). It was so pretty that I had to post a photo of it here. Luckily, it was out of the oven before the power went out again! No problem–candlelight is fine for eating….